Yellow River (Huang He) Delta, China, Asia. The Huang He or Yellow River is the second largest river in China after the Yangtze and has a total length of 5,464 km. The Huang He rises in northern China in the Kunlun Mountains in Qinghai Province, south of the Gobi Desert. The upper drainage basin originates in Ordos Basin and flows through numerous fold belts before reaching the Bohai Gulf. From its source, the river first flows east through deep gorges onto the Ordos Desert and finally through a relatively young valley in deposits of loamy soil known as loess. In this portion of its course, the river picks up and carries in suspension yellow silt, which colors the water. The drainage basin has an area of 865,100 sq km and the tributary density is extremely dense, 0.23 km stream length per 500 sq km (Figure 47). The average elevation in the basin is 1,547 m with maximum elevations reaching 4,240 m. Rainfall is relatively low, the average annual rainfall being only 300 mm a year, with a maximum and minimum of 754 mm and 6 mm respectively. The rainy months are May through September and the dry months are December through March when less than 25 mm of rainfall occurs. Most of the drainage basin is semi-desert or steppe grasslands. The alluvial valley is well-defined in the lower part of the drainage basin and is heavily populated. The average annual river discharge is 2,571 m3/sec, with a maximum of 2,858 m3/sec and a minimum of 543 m3/sec. The major high water period is from July through October. More than 100 million people live along the banks of the Huang He. In some places the water level of the river is higher than the land and dikes have built to try and stop the river from flooding. The river is often called "China's sorrow" because millions of people have been killed by flooding. The worst flood disaster in world history occurred in August, 1931 along the Huang He River in China and killed an estimated 3.7 million people. Between July and November, some 88,000 sq km of land were completely flooded, and about 21,000 sq km more were partially flooded. The Huang He has changed course in the eastern portion a number of times. For several centuries before 1852, it emptied into the Yellow Sea, south of the highlands of Shandong Province. The course shifted north that year, and, from that time until 1938, the river emptied into the gulf of Bohai. In 1938, during the Second Sino-Japanese War, the Chinese forces, seeking to impede the invading Japanese, destroyed the dikes and diverted the Huang He into the former course. The Chinese rebuilt the dikes in 1946-1947, re-diverting the river to the Bohai. The present delta is 36,272 sq km in size (14-i01). Although there are several distributary channels, the southern branch is the presently most active. This distributary has changed considerably in the past twenty years [14-i02 and 14-i03]. The delta grew nearly 400 km2 between 1989 and 1995, then began eroding back [Evans, 2002]. Between 1995 and 1997, the delta area eroded back about 255 km2. In 1997 a new channel was cut near the tip of the delta. From 1997 to February 2000, the delta tip again grew nearly 100 km2. Two factors contribute to the changes: 1) the river carries a heavy sediment load, leading to clogged channels and frequent river course changes; 2) the river is heavily engineered and water is oversubscribed, resulting in little flow to the coast in recent years (Evans, 2002). The river carries one of the largest sediment load of all major river systems. One hundred miles from the river mouth, the sediment discharge has been calculated to be 1.1 x 109 tons/year, exceeded only by the Ganges-Brahmaputra and Amazon rivers (Qian and Dai, 1980). 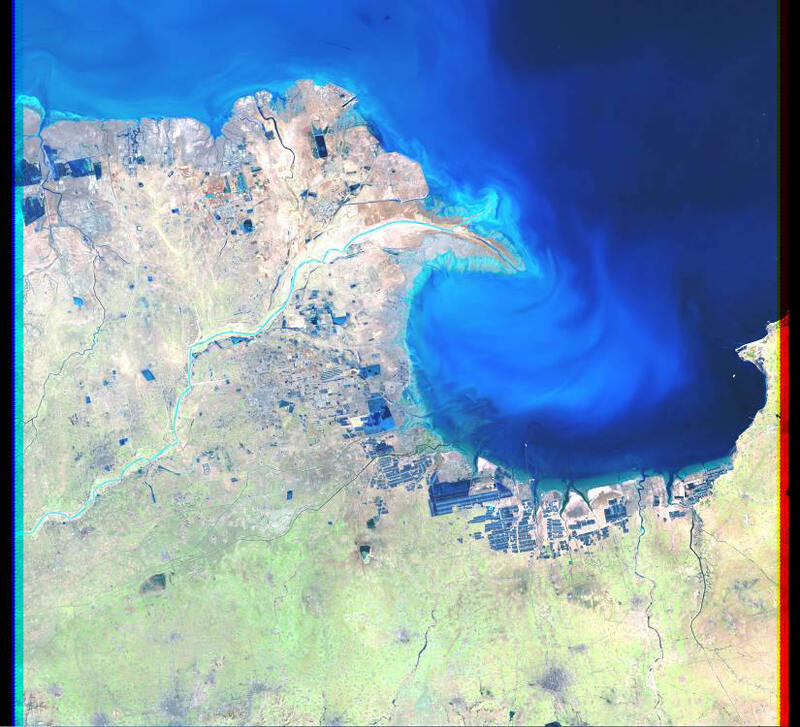 The sediment plume that emanates from the river mouth literally blankets the Bohai Gulf with suspended sediment (14-i07). The high sediment loads and concentrations of suspended sediment (often greater than 50 g/l) result from the rapid erosion of the loess plateau in the drainage basin and partly from historically poor agricultural practices (Yang, et al, 1998). This sediment discharge figure is based on data collected between 1950 and the late 1970�s. Recently, during the past ten years, the sediment load was only 0.018 x 109 tons/year, less than 1% of the annual sediment loads in the early 1950�s (Yang, et al, 1998). The most likely reason for this decrease is related to the decrease in rainfall and the corresponding increased use of the rivers water. The channel patterns in the delta are extremely complicated (14-i06 and 14-i05) and are constantly changing. Intensive modification of the original wetlands have taken place in the delta plain and few areas are in a pristine condition (14-i06). Tides at the river mouth are 1.13 m in range and wave power is extremely low because of the extremely low offshore slope (0.026 degrees) and limited fetch in the Bohai Gulf. Wave power is calculated at 0.218 x 107 ergs/sec/m coast and the root mean square wave height is 0.58 m.
At different times the mouths have been as much as 800 kilometers apart.